The hip is the joint of the femur in the acetabulum, or hip socket, of the pelvis. You can find the hip socket on your own body by placing one hand on the pubic bone and another on the bony point at the top front of one side of your pelvis (ASIS). If you follow along the hip crease the hip socket will lie approximately half way between these two points. Flexing and rotating the hip will allow you to refine exactly where your hip sockets are located. Knowing where your hip sockets are and how to soften the muscles around them is crucial in yoga. Forward bends come from the hip socket. Triangle pose comes from the hip socket, and so does downward facing dog. A great way to determine your range of mobility at the hip sockets is to lie on your back and hug one knee int your chest. Keep your low back and pelvis in a neutral position, relax all of the muscles around the hip, and use your hands (or a partner) to move your femur in the hip socket. Find as much softness in the hip crease as you hug your knee to your chest. This is your flexion. Now, keep your pelvis flat on the floor and take your knee toward your armpit. Don’t roll your pelvis. This is your external rotation. Apply this information to your poses – standing, sitting, forward bending, balancing – and see how they change. The acetabulum is formed by the three parts of the pelvis: the ilium, the pubis and the ischium. We’ll go more into the pelvis later. The femur is the thigh bone. The proximal end of the femur is shaped like a ball and fits snugly into the acetabulum which is lined with cartilage to fit the femur like a glove. Whenever possible imagine the femur softly falling into the hip socket. The femur then wings out to the side like a flying buttress to create the greater trochanter. The greater trochanter functions as the hub of a wheel to the many hip muscles that attach to it. The abductors and deep rotators stem from the greater trochanter out into a fan shape all the way around allowing for a wide range of movement. On the inside, you’ll notice a smaller notch. This is the lesser trochanter. It is most notably known as the distal attachment of the iliopsoas muscles which both flexes the hip and stabilizes the spine on the legs. 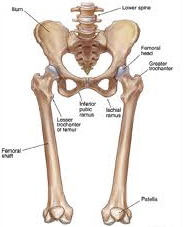 You’ll notice that the femur forms a diagonal as it travels from the greater trochanter to the knee. When standing in tadasana, it is advised to place the tibia and the feet directly under the hip socket. This optimizes the fall of gravity through the bones.